Epic Games is the force behind the massively popular Fortnite: Battle Royale, other hit games like Gears of War, and also Unreal Engine, which is a game engine that has powered hundreds of games from a huge variety of other developers. Epic also has an online store and game launcher that's similar to Steam. If you want to play with your friends in Epic titles like Fortnite, across different platforms like PC, mobile, and consoles, then you need to use the Epic Games launcher. The launcher allows you to add friends on Epic Games, and then play with them on the platform of your choice. The Epic Games launcher is only available on Windows and Mac, but adding friends on Epic Games allows you to play with them on any platform that you have linked to your Epic Games account. There are two ways to add friends on Epic Games. One requires you to know your friend's display name, which is the name you see when you play games together, or the email address they use with Epic Games. The other requires you to tie your Epic Games account to another social media account or gaming service. The first method that we'll cover requires you to know your friend's display name or email address. If you don't know their display name or email address, you'll have to find it out before you can use this method. There is no way to search for friends with the Epic Games launcher, so you'll actually have to ask your friend for their display name before you can add them. You can also enter their email address. If you enter the email that your friend used when they signed up, they'll get a friend request. If they used a different email, you'll have to ask what it is before you can send a friend request. Open the Epic Games launcher, and click Friends. If you don't have the Epic Games launcher, you need to install it. Navigate to Epicgames.com, and click Get Epic Games. Even if you play a game like Fortnite on a console or mobile, you still need the Epic Games launcher on your Windows PC or Mac if you want to add friends to your Epic Games account. Click the Add Friend icon. Enter your friend's Epic Games display name or email address into the Add a Friend field, and click SEND. Your friend will appear in the outgoing section until they accept your request. If your friend accepts your request, the outgoing message will disappear, and you'll be able to play with them whenever you're online at the same time. Click the add a friend icon to add additional friends. The other way to add friends on Epic Games is to connect your Epic Games account to another service. This is a great method if you have a lot of friends on other services that also use Epic Games. It's also a good method if you aren't sure what a friend's display name or email address is, because you don't have to waste time asking and waiting for them to respond. The services that Epic Games allows you to connect to are Facebook and Steam. 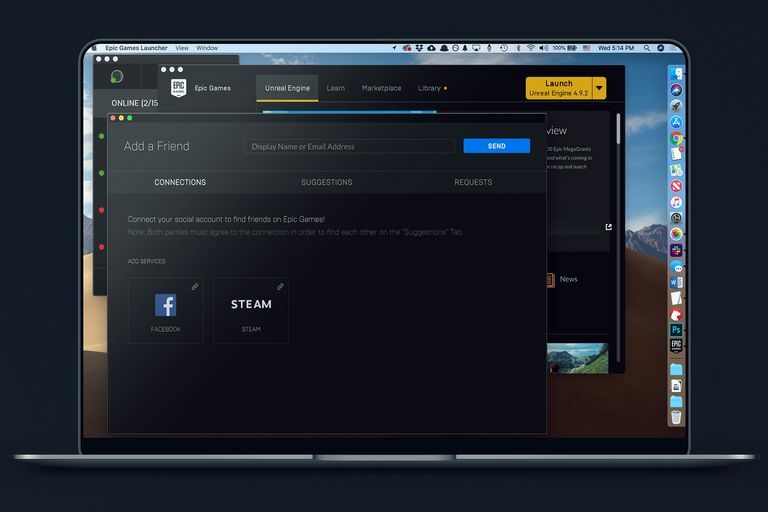 To accomplish this, you'll need to know your Facebook or Steam login information, and you'll need to give Epic Games permission to connect to your Facebook or Steam account. If you have two factor authentication activated on Facebook, you'll need to have access to the email you use with Facebook. If you have Steam Guard activated, you'll need access to either the Steam app on your phone, or the email you use with Steam. If you chose Steam, click on your personal Steam account to proceed. If your Steam account isn't displayed, make sure that you're signed into the Steam app on your device. Epic Games can't detect your Steam account if you aren't signed in. Enter your Steam username and password, and click Sign In. If you have Steam Guard activated on your account, you'll need to enter a code from the Steam app on your phone or wait for an email from Steam to proceed. Wait for the success message, close the browser window, and return to your friends list in the Epic Games launcher. If you haven't yet verified your email with Epic Games, click Resend Verification Email, follow the instructions in the email you receive, then click I HAVE VERIFIED MY EMAIL. You cannot proceed without verifying your email. If you don't see the verification email, make sure to check all of your email folders, including spam. Select the friends you want to add, and then click ADD FRIENDS. Even if your Steam friends are playing games like Fortnite, they won't show up in this list if they haven't linked their Epic Games and Steam accounts. If you don't see them in this list, ask them to link their accounts, or just add them as Epic Games friends via their display names. Repeat this process using the Facebook option, if you have Facebook friends who use Epic Games.